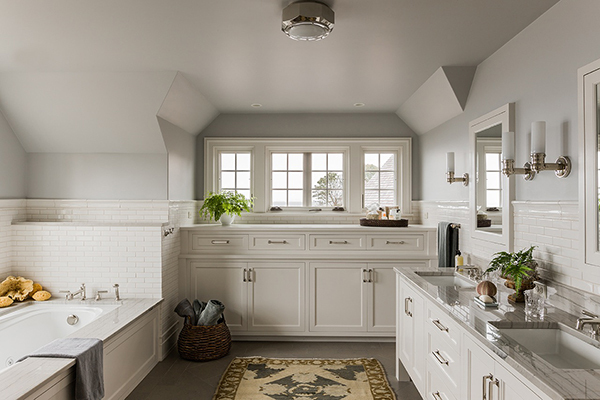 This award-winning master bath is traditional, tailored, and elegantly detailed. Our January/February issue is our annual look at distinctive kitchen and bath design. 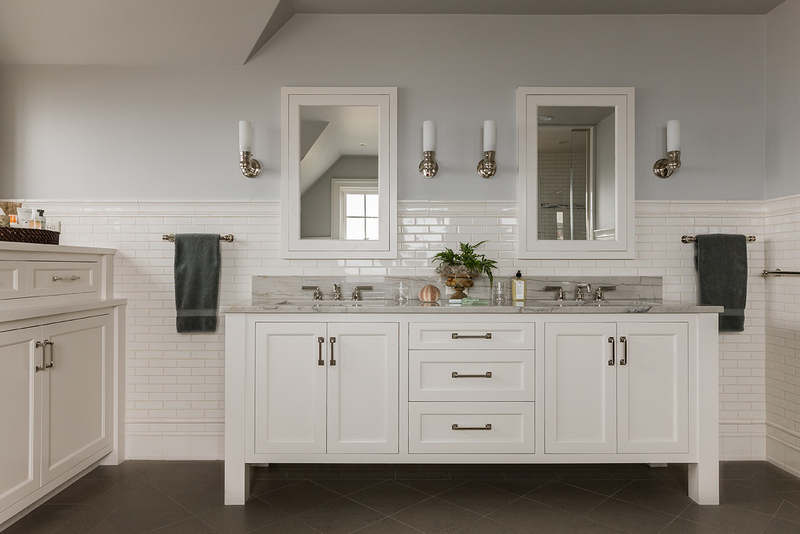 Planning for it reminded us of the handsome master bathroom that took first place in the American Society of Interior Designers (ASID) New England Excellence in Design Awards earlier this fall. While the space was in a newly constructed wing of a reimagined oceanside property, designer Anne Alberts of Carpenter & MacNeille, architects and builders in Essex, Massachusetts, created a gracious restful space befitting the original 19th-century cottage. The client’s style was both traditional and tailored, traits reflected in the tidy, but highly detailed built-in storage unit set in an alcove under casement windows trimmed out with simple wide moulding. The dark gray tile floor accentuates the straightforward design of the double vanity. Likewise, the double vanity is both visually pleasing and highly functional. The medicine cabinets are straightforward, the hardware unfussy, the sconces minimal, yet all together, they convey a thoughtful and thought-through design approach. A long deep soaking tub trimmed out with the same glossy soft gray Luca de Luna stone that tops the vanity makes it a spa-like haven. Tying the room together is white subway tile, a timeless classic material that still looks as stylish and sophisticated as it did in the 19th-century. Great design is always at your fingertips — read the November/December 2013 issue online!